Meet Edmund. 83 years young. He lives in West Gore, Hants County, Nova Scotia. 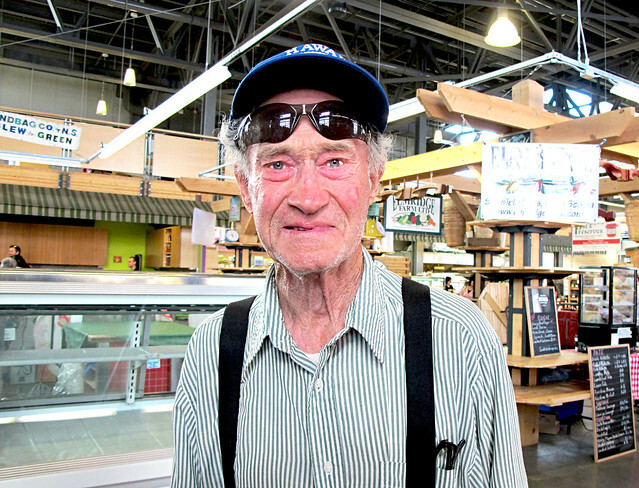 This was his first time here at the Seaport Market. On Sunday, he hopped in the car with his wife and drove here to have a look around. What is interesting about this story is that Edmund and his father, Hope McPhee, used to sell at the market in the 1930's. 70 years ago! and they did it for 28 years! At that time it was called the green market and was held under the Town Clock. He and his dad used to travel in every Friday. Edmund skipped school on Fridays as soon as he was able to count change. Never went back after grade 9. Edmund continues to live in the area where he grew up. Where there used to be 28 farms there is now just himself. He still has a large garden and for the last month and a half, he and his wife have been eating happily from it, he told me proudly with his blue eyes twinkling. Aw, this is a touching blog post. You are right, you never know who you might meet and what kind of interesting stories they have. 10 Top Tips for Market Shopping!